Please note that an adult must stay with the child who has booked during the session. Run by our specialist Music teacher, this 30 minute session will provide a range of rhymes and songs for children. The session provides an environment that is both stimulating and nurturing for toddlers. Early experiences with music and movement give your toddler an early learning advantage. Music, specifically singing songs and speaking rhymes and chants, improves language development. 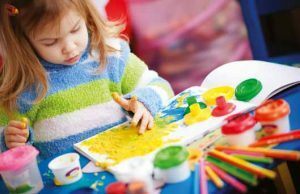 Run by our specialist Art teacher, this 30 minute session will provide a range of messy art activities for children. Our Art Splash session grows the children’s confidence and independence while further developing their creative minds.